The area of the present Biddenden parish contained in Saxon times a number of separate 'dens' or small clearings in the great forest of Andred. Between 700AD and 900 AD freemen and swineherds would return to the same clearing in the forest, and this resulted in the dens becoming named after the family or household who used them. 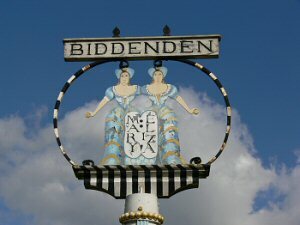 Biddenden (Bydyndene in 993) was probably the den used by the family and followers of the Jutish man Bidda. Bidda's main holding may have been near Wye. The many houses with 'den' endings to their names indicate where other clearings were made in this forest; many became attached to manors elsewhere in Kent. According to tradition, twin sisters were born in 1100, joined at the shoulders and hips. The story describes how Elisa and Mary Chulkhurst lived in this condition for 34 years, when one of them died. The other, refusing, or more likely, it being impossible for her to be separated from her sisters body, died shortly afterwards. Perhaps, as they were being carried on a litter to the care of the monks at Battle Abbey. Local records show that for 400 years the church has gained an income from the 20 acres of land, west of the church. Believed to have been bequeathed by two sisters, and had been used for the benefit of the poor of the village. For most of this time, the charity has given bread and cheese on Easter Monday to the needy of the Parish. Gradually, tracks became established and the clearings were enlarged for houses and crops. Eventually the village Centrex developed as a trading point where several tracks met and the first church was probably built there. 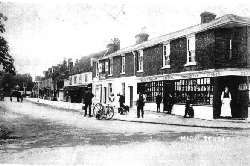 In order to provide some footing in the mud of the old droves, causeways of Bethersden Marble were eventually laid by the Tudor clothiers for their pack horses. Remains of theses can still be seen, not only on the village pavement, but also where footpaths cross woods and fields. Quotations used in this local History Section come from the "The Story of Biddenden", produced by the Biddenden Local History Society which is available form the village.